Countess of Fairmount, is destined for a charmed life. Soon she will be presented during the London season, where she can choose a mate worthy of her status. Yet Tory has a shameful secret—a secret so powerful that, if exposed, it could strip her of her position and disgrace her family forever. Tory’s blood is tainted…by magic. When a shocking accident forces Tory to demonstrate her despised skill, the secret she’s fought so hard to hide is revealed for all to see. She is immediately exiled to Lackland Abbey, a reform school for young men and women in her position. There she will learn to suppress her deplorable talents and maybe, if she’s one of the lucky ones, be able to return to society. But Tory’s life is about to change forever. All that she’s ever known or considered important will be challenged. What lies ahead is only the beginning of a strange and wonderful journey into a world where destiny and magic come together, where true love and friendship find her, and where courage and strength of character are the only things that determine a young girl’s worth." *Anything that combines my two favorite genres, historical fiction and fantasy, is a book that I must read! I can't wait for this one! Great pick Christina! I just read an excellent review of this in Romantic Times. I will have to add it to my TBR list. I haven't read any of the author's books for adults but this sounds fantastic. This is one of most anticipated release this year. Great pick! This sounds really good and I love that cover. Fabulous. Thanks for sharing. I have to admit that 'Fantasy' is not one of my usual genres, although I do read 'Historical Romance' from time to time. However, the combination of the two genres in this book, is very tempting. That and the imaginative cover art, sees me adding this to my 'wish list'. Thanks for bringing this book to my attention. And for some reason it reminds me or the Harry Potter mirror. This sounds amazingly good, I'll have to add this to my TBR list! 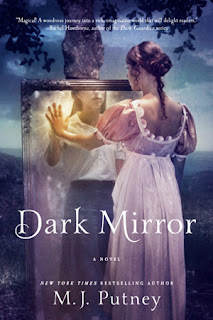 I really want to get Dark Mirror too can't wait for March 1st. Thanks for checking out my WoW pick. Hope everyone has a great week. I'm excited to read this one, too! Great choice!